As manufacturers begin to integrate apps into their Internet-connected devices, Samsung has already surpassed the 5 million app downloads on its Samsung Apps TV platform, just over a year since it launched. In January, Samsung announced that the Samsung Apps platform, the world’s first app store specifically for televisions, had helped facilitate two million app downloads globally, reaching the milestone in under a year since it launched. Whilst it took 268 days for the store to reach one million downloads, it only took 53 additional days to reach two million, with consumers downloading an average of 100,000 applications every five days. 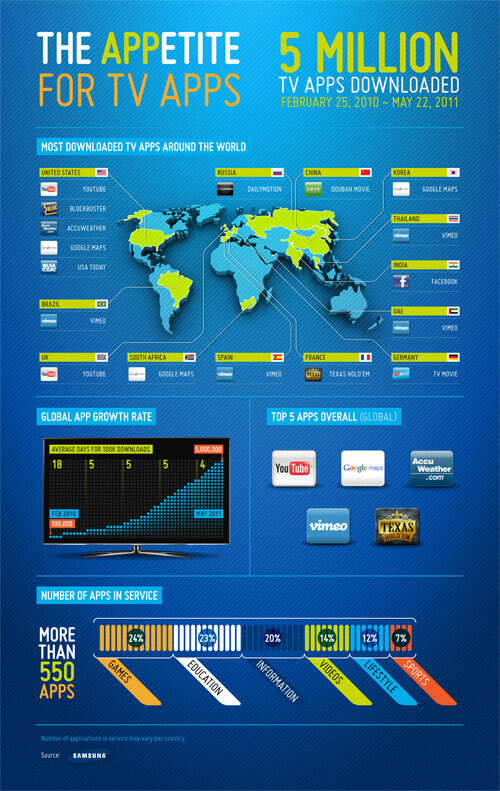 Samsung TV Apps Store is available in over 120 countries and accounts for more than 550 apps. The most popular applications include YouTube, Google Maps, Accuweather, Vimeo and Texas Hold’Em.